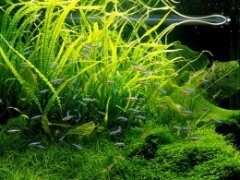 I know this isn't a freshwater tank, but I just had to share this when I found it. 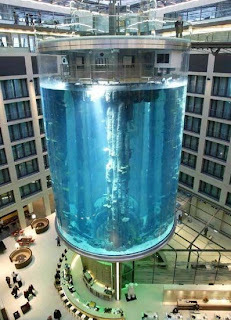 This is the world's largest cylindrical aquarium apparently. 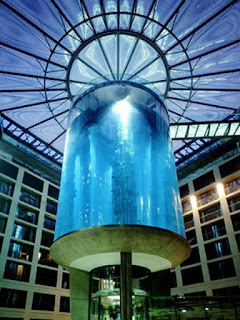 It's located at the Radisson Hotel in Berlin and by my calculations is roughly 695,000 gallons! It's so big you can scuba dive in it. Imagine doing a water change on that? very cool....looks like a warp core...btw, I've been lurking on your website for a week or so and think it's great...my name is Ray and I had a 20gal aquarium a while back and not longer have it....Now, I am planning on re-starting one maybe a 10g or a smaller one. Thanks for a great and informative website! Good for you Ray! Good luck and I'll be writing some articles focused on beginning a tank and more beginner oriented articles soon! One heck of the tank. Incredible! Would love to see some closer photos of it. I enjoy reading your blog by the way, especially the plant, equipment, and fish reviews.